With its captivating storyline and amazing special effects, the Harry Potter series is not only a favorite of children across the globe, but also for adults! The whole experience of standing in the footsteps of Harry Potter and his Hogwarts friends at various locations in London will surely be an experience of a lifetime. So, here are the top 7 Harry Potter locations you can see in London. Start off this amazing journey by visiting King’s Cross Station on Euston Road. This is the station where the students board the Hogwarts Express on platform 9 ¾. While the secret portal between platforms nine and ten is fictional, there is a sign posted on the wall where it should be…allowing for a great photo opportunity. Create a memory by clicking a picture and enjoy buying Harry Potter merchandise, such as books and films, from the Harry Potter shop. The adjacent Victorian building, St. Pancras Station, was used as King’s Cross Station’s exterior in the movie. One of the more important moments of the movie happened at the London Zoo in Regent’s Park. Along with the Dursleys, Harry paid a visit to the Reptile House, where he realized that he could talk to the snakes. Inside the Reptile House, you will find a plaque alongside the tank that held the boa constrictor in the movie; but in actuality, it is home to a black mamba. Make sure you have explored other parts of the London Zoo as well; it will surely be a great experience for the kids. 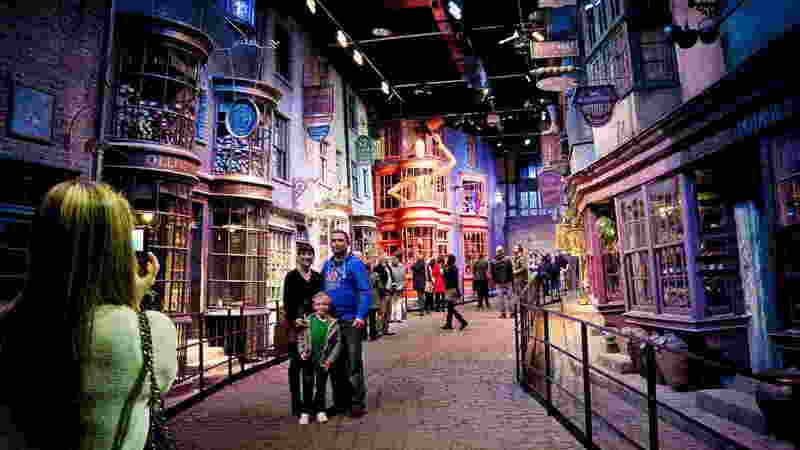 One of the notable locations in Harry Potter’s London is Diagon Alley, as it is the popular paved wizarding alley & shopping area where students buy their supplies. Here, you can find shops, restaurants, and various other sites relating to the movie. Leadenhall Market, a beautiful Victorian covered market in London, was used to shoot the exterior of the magical alley in the first movie. At Bull’s Head Passage, a section of the market, you will come across the blue shop front used as the Leaky Cauldron’s entrance in the movie. The legendary wizarding bank, Gringotts, was inspired by Australia House, where the striking bank’s interior was shot. Since the Australian High Commission is housed in the building, it is important to have a valid reason for entering, such as a visa application, or else you won’t be granted access. In the movie, Harry Potter and the Half-Blood Prince, Harry learns about the attack on Millennium Bridge while sitting in a café which is built in a train station. This is also the exact place where he got picked up by Dumbledore. You will find both the platform and the café inside the Surbiton Railway Station, and it is located towards the southwest part of London. If you feel like the station is a bit too far, don’t worry, as the Westminster Tube Station will serve as a great alternative. This underground station was featured in the 5th part of the series. You will find the station near the Houses of Parliament and Big Ben. Professor Flitwick is the Charms teacher at Hogwarts. The Charms classroom that you get to see in the Harry Potter movies is actually the Harrow boarding school for boys, and it dates back to the 16th century. You will surely love the beautifully-maintained gardens and grounds, and it also gives you a perfect opportunity to snap a few photos. While you are exploring Harrow School, you also get a once in a lifetime opportunity to visit one of the best boarding schools in Britain. If you really want to travel to Harrow, then it can be easily accessed from King’s Cross Station. In the opening scene of Harry Potter and the Half-Blood Prince, you see the dramatic scene of London’s Millennium Bridge collapsing. Since the bridge is a pedestrian-only bridge, make sure you enjoy a leisurely stroll before you leave London. From the bridge, you can see St. Paul’s Cathedral, which was used to film some of the winding staircases of Hogwarts. Adam Smith is a content writing professional at Followthesteps, an inbound marketing and sales platform that helps companies attract visitors, convert leads, and close customers. Previously, Adam worked as a marketing manager for a tech software startup. He graduated with honors from California University with a dual degree in Business Administration and Creative Writing.